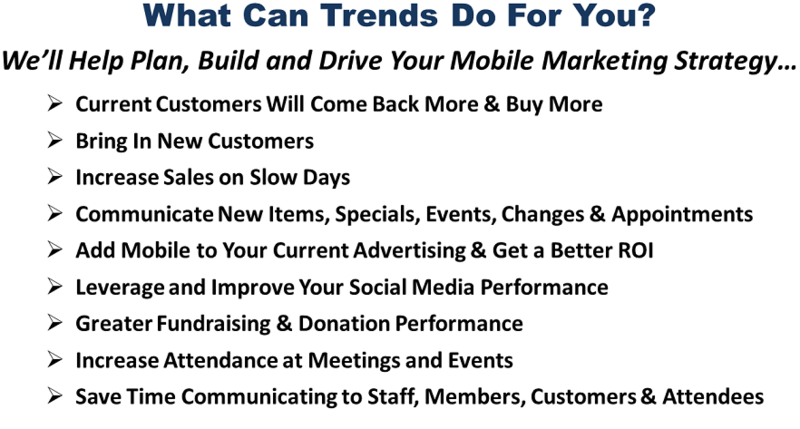 Are You Leveraging Mobile Phones to Grow Your Revenue and Build Your Customer/Client Base? We’ll help you add mobile phones to your marketing strategy. Build loyalty programs to bring your customers in more often and buy more each time they visit, plus leverage your customers to bring in new customers. Increase sales on slow day, build your total sales and get a great ROI. Mobile Websites, Mobile Apps, Text Messaging, Mobile Coupons, Virtual Loyalty Punch Cards, Slow Night Promotions, New Product Promos, Birthdays, Facebook/Twitter Promos, Text To Win, Questionnaires, Polls/Surveys, Scavenger Hunts, Email Integration, Appointment Reminders, Kiosks, QR Codes, and more. ● Your advertising will be more productive by adding Text Messages and QR codes to your ads (i.e. Radio, TV, Newspaper, Magazines, Direct Mail, In-Store and Outdoor Signs...) making it easier for customers to contact you and save your coupons on their phone -- providing a greater Return On Your Investment. ● Text Messaging and Mobile Coupons lets you leverage social media (i.e. Facebook, Twitter, Instagram...) allowing your customers to easily Like and Share your business, promotions, and coupons with their Friends which can aggressively grow your customer base. 1) Increase Fundraising & Donations through text reminders, mobile coupons, links to URL information and donation pages. 2) Through Text Message Reminders increase attendance and participation at meetings, events, presentations, ceremonies, services/masses. 3) Easily Communicate time/date changes, room and location changes, deadlines, cancellations, emergencies, crisis, weather issues, surveys, questionnaires and more. 4) Before, During or After Events provide real-time information and changes to participants and attendees. Use our Kiosk feature to conduct questionnaires and surveys to gather information or sign people up to receive text messages. 5) Use Groups to customize your communication (i.e. staff, members, board members, volunteers, students, parents, alumni, teams, events, study groups...). Eliminate or minimize phone trees/chains. 6) Set-up a Mobile Website or Mobile App to better communicate, provide mobile functions and a better image on mobile phones and tablets. Contact Us for a Free Consultation and a Price Package Designed for your Business or Organization!